Welcome to Pepperoncini Italian BYOB Restaurant and Catering, a delicious slice of Italy right in the heart of Havertown. Developed from the same authentic recipe as Pepperoncini in Conshohocken and Pepperoncini Sotto in Phoenixville (but just a little closer to home), Pepperoncini Italian BYOB chef/owners Tommy and Dan, will spend as much time chatting and taking care of you as they will making sure you’re well fed. Walking through the door, you’ll immediately smell the unmistakable aroma of meatballs, pork and sausage simmering for hours in homemade sauce; succulent appetizers, side dishes and desserts; and a “family” that looks forward to seeing you, feeding you, sharing a laugh, and maybe sneaking you a glass of wine. Amazing meal this past Saturday evening. We had only recently learned of this restaurant. We will definitely be back. Our server, Nancy, was so attentive & friendly. The food was scrumptious. Thanks for making our meal so special!!! We live close by Pepperoncini's, so it is a great little BYOB! Specials and main menu have something for everyone's tastes buds. Great food / outstanding service and large plates. Another great evening. Kelly, Nancy and the whole team are great. Thanks for allowing us to have a beer/ glass of wine while we waited. Our friends enjoyed their dinner and the hospitality. Great time! Maybe because it was a busy Saturday nite, but I was really underwhelmed. Wonderful first time experience. Portions could be a little larger for the cost. This place is ok, I wouldn’t rave about it to my friends but the food was fine, just kind of pricey for what you get. I paid $20 for literally 5 raviolis and was still hungry after I finished them, which I have never experienced at an Italian restaurant ever. Also felt like the staff was rushing us out as soon as we finished our plates. Overall it was pretty underwhelming. The service was great but the food was mediocre. Probably wouldn't return. We were seated immediately-7pm reservation. Our wine was opened shortly there after. Dinner was right on time. I had the special....... chicken piccata with shrimp over linguine that was delicious and my husband had the spaghetti with meatballs and sausage which was also excellent! I make my own meatballs and these were very close to homemade. The ricotta cheesecake is out of this world! The food is absolutely amazing. Don’t leave without having the butter cake for dessert! I ordered the Wahoo for Dinner. It came with shrimp and tomatoes. Tomatoes were scarce, shrimp was OK, nothing special, but Wahoo was over cooked. I was starving and ate the shrimp and picked at the fish. Server asked if something was wrong because I put my plate aside so she would clear it. I told her I didn’t care for it because it was over cooked. She said she would “ask” if “she” would take it off the bill. Meal ended- got the check- fish ($33) was still on the bill. After inquiring about taking it off/ she said “she” said my plate looked like it was eaten. 😂 Seriously?? I have been a customer of this restaurant for years! Is “she” stupid? For $33 she lost a customer- we will never return. The servers and hostess seemed unprepared for the busy Saturday evening. Great food and prices are very reasonable. and Nancy is the best server!! I had a 7:30 reservation and was not seated until 8:00pm. This doesn't usually bother me, but the hostess was so unconcerned and never even apologized or acknowledged the situation. This was very off putting to me. There were 3 parties of 4 crammed into the corner for over 20 minutes. 3 tables opened up at the same time. Instead of helping to set the tables up, the hostess chatted for 10 minutes with a table who was just finishing up and left us all standing there and the busboy & waitress scrambling. I believe the owner was in as well and never acknowledged us either. This is just rude! I don't mind waiting, but an apology is appropriate. I will say the food was quite good, although the portion size was inconsistent in the entrees. Our waitress was very pleasant, but clearly pushed to the limits. This is very disappointing. I live in Havertown and try very hard to patronize local business. At the risk of sounding like a jerk, I will also mention that the tables are entirely too close together. I understand it is a small place, but my husband had to sit on an angle just to fit at the table because we were beside a larger group. There is so much potential here, but customer service needs considerable work. Great neighborhood BYOB. Always enjoyable and great food. Our server Nancy was awesome, food was incredible. Valentine Day night out! Pepperoncini's was very busy as usual on an holiday. 20 oz. porterhouse steak was perfectly cook. My wife had the salmon. Salads can be for two people, very big portion. Outstanding "BYOB" in Havertown, always over the top specials. Service was just adequate, no personal contact she was aleays distracted. Wonderful food. Terrific wait staff. Cozy atmosphere. It was extremely busy while we were there. Many people were celebrating Valentine’s Day! That being said, we were greeted quickly and after a short wait escorted to our table. We had some wine and looked over the extensive specials menu. We ordered and our food came in a timely manner. The food was excellent and hot. We were not rushed and throughly enjoyed everything we had. Jackie was our waitress and she was wonderful. It is always great to see Kelly and Nancy. Another wonderful night. Always friendly and efficient service. Kelly is awesome. Wide variety of specials. Food is consistently delicious. Great neighborhood place to dine. This restaurant is obviously getting more and more attention as it was very crowded when we arrived for our 7 o’clock seating on a Saturday night. With six people waiting to be seated we were literally standing right next to other diners and it felt like we were an annoyance to them, which is understandable. It was too cold to stand and wait outside. After we were seated, the one and only annoyance we had was the terribly wobbly table. It might be a minor pet peeve, but they need to invest back into their facilities with better table tops. Have dined there several times and the meals have always been great ; plenty of good options to pick and they are always willing to substitute . Service is very good and highly recommend it for any occasion . Love this place. Food is great. Specials are always special. Go early -- it gets busy. Overall experience was very good. They made a special attempt to get us seated earlier than the reservation, as the weather was getting worse as the snow began falling. The service was pleasant as always. The fish dishes were very good and fresh, particularily the Mediterranean Sea Bass.Very favorable comments on the pork chop as well. We will return again, worth the trip for us. First time at this restaurant. Definitely go back. Great service and food. Very relaxing and enjoyable. Food and service were excellent. Our waitress Nancy was very personable and did a great job. My only complaint would be that the tables are on top of each other and I felt like I was sitting with the people at the next table. Four of us ate dinner two evenings ago. The restaurant was quiet. Three of us enjoyed our entries; my fish was very good. My husband had the veal and scallops on angel hair pasta. The pasta and he scallops were good, but the veal was tough. He said after dinner he should have sent it back to the kitchen. He won’t return. We shared a cake dessert which was good and very very sweet. Good Byob - we have been 5 times and it is good and consistent with a very good special menu. The food was delish and the servers were very attentive. Great meal had by all! It was the first time for 6 of the 8 people and it pleased even the fussiest of the foodies. 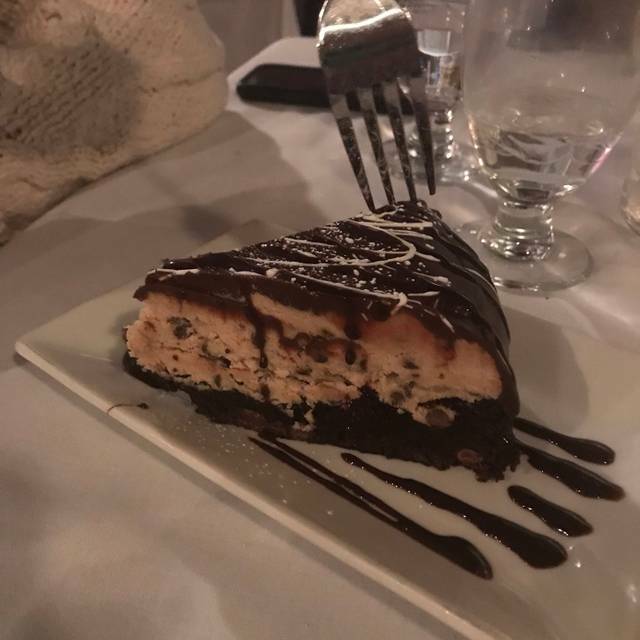 Excellent service and delicious dessert!